Roughing It is semi-autobiographical travel literature written by American humorist Mark Twain. It was authored as a sequel to his first book Innocents Abroad. This book tells of Twain’s adventures prior to his pleasure cruise related in Innocents Abroad. . . .It is chloroform in print. If Joseph Smith composed this book, the act was a miracle—keeping awake while he did it was, at any rate. If he, according to tradition, merely translated it from certain ancient and mysteriously-engraved plates of copper, which he declares he found under a stone, in an out-of-the-way locality, the work of translating was equally a miracle, for the same reason. "Turn out, boys! The tarantulas is loose!" Mark Twain's semi-autobiographical work about the American west in the 1860's. 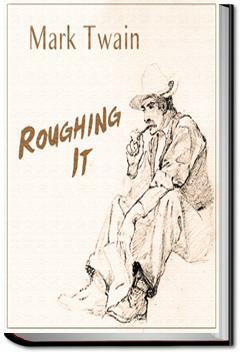 The first quarter of Roughing It is really great -- the description of his stage coach trip with to Nevada is great travel writing, laced with irony and sly humor. That it is describing a lost world makes it that much more entertaining. Exquisite. Yes, take it all around, there is quite a good deal of information in the book. I regret this very much; but really it could not be helped . . .
Tag along on some travels with Twain as he heads way out west, commenting nonstop on all the new flora and fauna he sees along the way.